"As priesthood, temple, and mission blessings are gathered 'together in one... in Christ' (Ephesians 1:10) and synergistically interact in the heart, mind, and soul of a young missionary, he can qualify for the work (see D&C 4:5). His capacity is increased to fulfill the responsibility to represent authoritatively the Lord Jesus Christ. 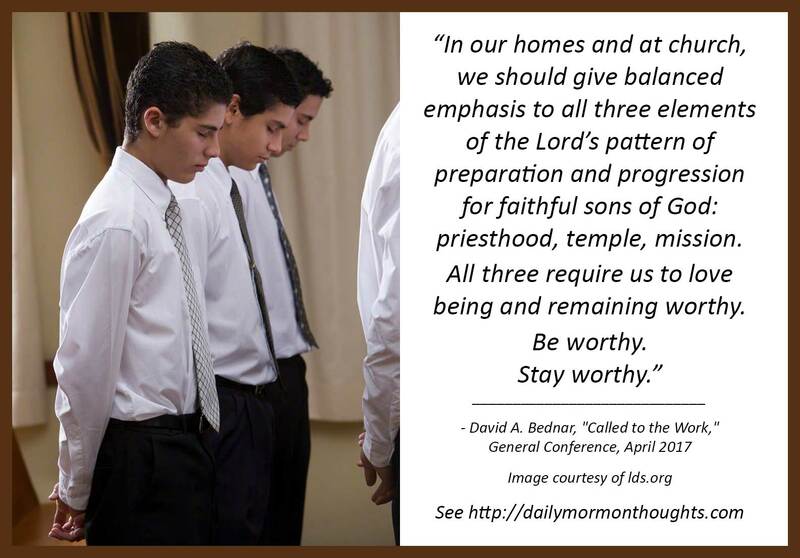 The spiritually potent combination of honoring priesthood and temple covenants, receiving 'the power of godliness' (D&C 84:20) through priesthood ordinances (D&C 84:19–21), serving selflessly, and proclaiming the everlasting gospel to God’s children enables a young man to become 'firm and steadfast in the faith' (Helaman 15:8) and 'rooted and built up in [Christ]' (Colossians 2:7). "In our homes and at church, we should give balanced emphasis to all three elements of the Lord’s pattern of preparation and progression for faithful sons of God: priesthood, temple, mission. All three require us to love being and remaining worthy. Be worthy. Stay worthy." 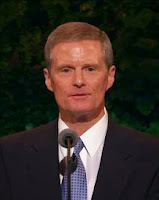 Elder Bednar spoke during the Priesthood Session of the recent general conference. He was primarily addressing the young men in issues relating to their preparation for future service and growth; but many of the principles apply to young women as well. Elder Bednar discussed the efforts we make to help youth prepare, which are often focused on mission preparation; but he encouraged additional focus on the other important aspects of the young man's development: priesthood, temple, mission. When all three of those areas receive attention in a young man's preparation, or in an adult life, then it becomes a "spiritually potent combination" of growth and development. Elder Bednar also had a subtheme, repeated three times in the talk: "Please learn to love being and remaining worthy. Be worthy. Stay worthy." How critical that is for our happiness in life!